Patellofemoral pain is a pretty vague one but can trouble nearly half of all runners at some point in time. So much so it’s often called “runner’s knee”. It occurs around the kneecap and can be on the surface, underneath or on the edges. Sometimes all three at different points in time. The quads take a lot of the blame for it and they do have something to do with it but aren’t the cause. 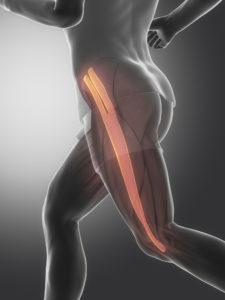 The poor quads are suffering from overuse and stiffen/tighten as a result of this. This overuse comes about as a result of the calf/hamstrings/glutes not pulling their weight. Sometimes it is all 3 but will be at least 2 of them. Bottom line is there is a breakdown in the system that results in the quads taking on more than their share of the load. They eventually weaken through simple fatigue and stiffen to protect against this. IT band pain is another common one. The sit of pain here is on the outside of the knee, above the joint line. It occurs when a little pad that is there to stop the ITB rubbing against the femur gets irritated. The pad is supposed to get compressed, that’s its job. The problem occurs when the length of time and amount of compression goes beyond a certain point. As with PFP the issue lies with the posterior chain. We want a shallow knee angle from touch down to toe off. If this increases then so does the amount of time spent with the pad being compressed. We also want a stable hip. When the hip isn’t stable you see the torso fall away a bit and the pelvis drop. This increases the amount of pressure being applied. The patellar tendon is the one that connects the quads to the tibia. The quads attach to the patella and the tendon covers blends around it forming the thick tendon you can feel below the kneecap. Again, stiff/tight quads are, sort of, to blame. The quads are, again, taking up the slack for work not being done elsewhere. Similar to achilles tendinopathy it is a tensile loading issue. That is the tendon is being asked to lengthen too much under load. This is happening when the foot hits the ground and the knee bends. All 3 of the problems are overuse issues where too much has been done either too soon or for too long. This leads to a situation where the ability of the posterior chain to do its job gets compromised. This then leads to more stress on the quads in PFP and patellar tendinopathy and on the insertion area of the ITB. When increasing the training volume do it slowly. No more than 10% per week until the desired goal is reached. 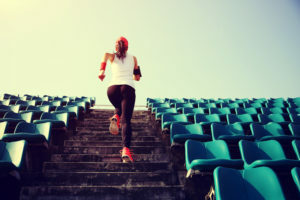 Be prepared to spend a couple of weeks at each step as you get closer to the goal. Do some strength training. You can’t go wrong getting strong. It adds in wiggle room and helps prepare the tissues for the demands of running. Do more easy work than hard work. No more 20% of your week should be hard. The rest should be done at low heart rates/rate of exertion. What is a low heart rate? Think 180- your age. 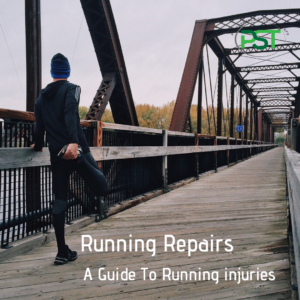 Previous PostPrevious Knee Pain When Running – What’s Missing? Next PostNext Osteoarthritis – The End Of The Road?